Great tasting drinking water is the key to increasing your water intake. Adequate water intake is associated with some amazing health benefits, but if your tap water doesn’t taste great, you may find yourself reaching for sugary drinks and other beverages. Fortunately, the Zip Hydrotap Arc BCS is not only stylish but can provide water you’ll love when you want it. A zip water tap can transform dull, tap water into delicious, crystal clear drinking water. This smart appliance will provide boiling, chilled and sparkling water in an instant. Whether you want a delicious and refreshing cool drink or a hot cup of coffee, the Zip water tap will provide the precise water temperature you need. You’ll be amazed at how the Zip Hydrotap can enhance the flavour of your coffee, tea, and other beverages. 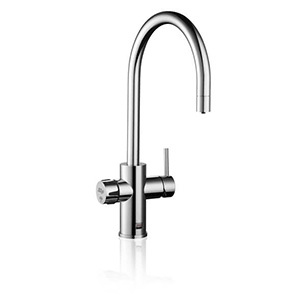 Zip hydrotaps are not only functional but can add a stylish touch to your kitchen. This advanced water appliance is available in a number of different designs and colours to suit your personal preferences and room decor. The Zip Hydrotap Arc BCS not only eliminates the need to occupy valuable fridge space with water bottles and clutter your countertop with a kettle but effortlessly complements your workplace or home. This can transform your kitchen into a safe and stylish environment. The Zip Hydrotap range features an interactive full colour touchscreen display and allows you to activate the boiling water safety mode. You can also choose between the three energy saving modes that include “sleep when it’s dark.” The under bench command centre incorporates the screen, refillable CO2 cylinder, and 0.2 micron water filter, so everything is kept neat and out of sight. So, while you can benefit from the superb functionality of the Zip Hydrotap, you can ensure that your kitchen design looks sleek and stylish. Whether you want to enjoy sparkling water or a Zip boiling water tap, you will be benefiting from the latest technology innovations. Each Zip Hydrotap is an advanced appliance that offers boiling, chilled and sparkling water on command. This Australian made integrated innovation is a combination of MicroPurity filter technology and PowerPulse boiling, Cold Core Carbonation and Direct DryChilling devices to transform your tap water into remarkable drinking water. With the advanced technology of Zip Hydrotap, you can take your kitchen to a whole new level. If you would like to know more about the benefits of Zip Hydrotap Arc BCS systems, you should contact us. The Aussie Natural Filtration team are on hand to address any queries you may have about Zip hot water tap prices and specifications. We would also be delighted to answer any further questions you may have.